Stunning metal ornament for your Christmas Tree or Ornament stand. Packed full of detail and adorned with beads to make the season bright. 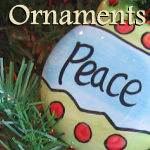 Each handcrafted ornament is approximately 4 1/2" of nickel, copper, and brass. All are two sided, which means that they can hang and spin and show great detail on both sides. 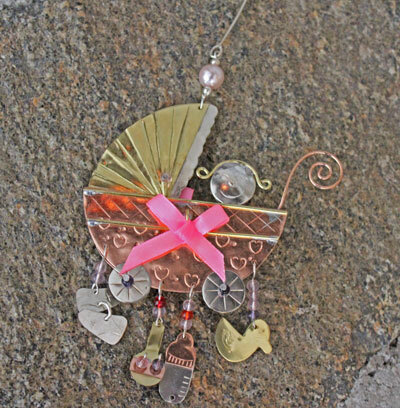 The Baby's First Christmas Ornament (in pink) measures 4 1/2" x 4". This ornament was hand produced in a small village in Thailand. Pilgrim Imports mission is "Working Together for Good" and aims to ensure that craftspeople in the village earn a fair wage... one which will keep their families and village together while providing a better life for their children. THERE IS NO DATE TAG ON THIS ORNAMENT. IT IS GOOD FOR ANY YEAR!